When you write a check, you don't always have to specify who gets the money. A check that says "Pay to the Order of: Cash" can be cashed or deposited by anybody. That may be convenient, but it's also risky. What Is a Check to Cash? Most checks are made payable to somebody. Part of the process of writing a check is listing who should receive the funds. 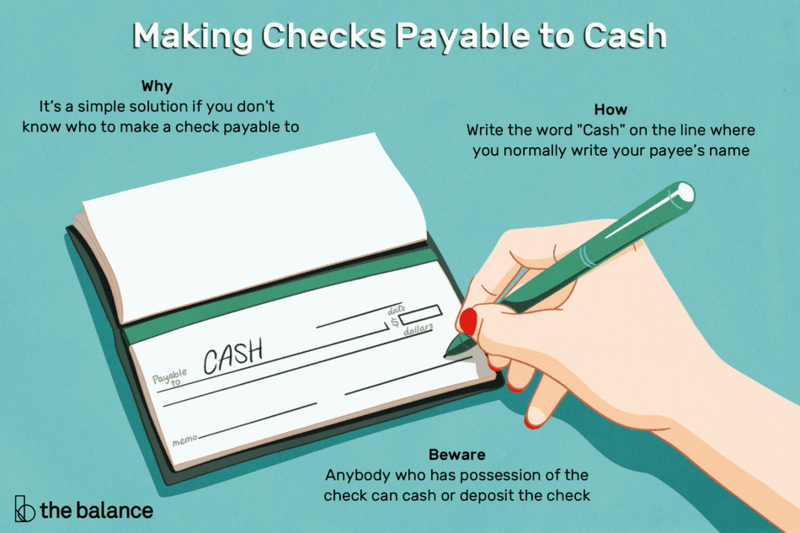 That step makes checks safer than cash because the named payee is the only person allowed to deposit or handle the check (although it can be signed over to somebody else, which we’ll discuss below). A check payable to “Bearer” works the same way: Anybody bearing (or “carrying”) the document can cash it. To write this type of check, just write “Cash” instead of naming a payee. A check payable to cash is (more or less) similar to cash—anybody can use it, assuming the check doesn’t bounce. If the check gets lost, whoever finds it can cash it or deposit it unless you stop payment on the check first. Likewise, the recipient can give the check to somebody else. Why Write a Check to Cash? Unknown payee: Writing a check payable to cash is a simple solution if you don't know who to make a check payable to. For example, you might know that you need to write a check for a certain amount, but you don’t know the payee's exact (or legal) name. You can write a check to cash, slip it in your pocket, and leave your checkbook at home. Paying yourself: You might also use “cash” if you want to write a check to yourself and get cash. But it's probably easier to just withdraw cash from an ATM (you won't use a check, and you don't have to wait for a teller). Likewise, when moving money from one bank account to another, it’s most likely easier to transfer funds electronically. Why Not Pay to Cash? Risk of loss: It’s typically best to avoid writing a check to cash because you don’t have any control over who deposits or cashes the check. If the check gets lost or stolen, you and your bank will have to watch for a fraudulent transaction. If you’re unable to catch it in time, you have to take legal action against whoever deposits the check to recover your money. Especially if you’re sending a check through the mail (or having your bank print and mail checks via online bill pay), there’s a significant opportunity for loss or theft. Hesitant banks: Some banks don't like checks that are payable to cash, which is another reason to avoid using them. Banks may refuse to honor them altogether or place a longer hold on the funds. Banks can also refuse to provide official checks payable to cash. For example, if you’re buying a used car from an unknown buyer, banks are not eager to give you a cashier’s check until you have a specific name for the payee. Paper trail: A check without a payee makes it harder to keep records and document transactions. It’s still possible to keep notes and track expenses, but a payee’s name in your own writing makes things easier (and official). You don’t need to decipher anybody’s signature or wonder who exactly received your money. Better solutions? Instead of writing a check that anybody can cash, consider leaving the payee line blank temporarily. Once you know how to fill it out properly, you can fill in the payee. A check made out to cash is about as secure as a check with the payee’s name blank anyway—either way, it’s negotiable by anybody (but at least it won’t be your handwriting if somebody steals the check and fills in a name). Another alternative is to make checks payable to yourself and sign the check over to whoever you want once you identify the right payee. That method is better from a security standpoint, but banks sometimes refuse to accept checks that have been signed over (which means you’ll need to start over). If you receive a check payable to cash, deposit it like you would any other check. Endorse by signing the back with your account number, and deposit with your bank or credit union. If you prefer to cash the check (instead of depositing it to your account) you may have to go to the bank that the funds are drawn on. Find the bank's name on the front of the check and contact the nearest branch to see if they will cash the check. Remember that banks may refuse these checks or require extra hold times. Whenever possible, request that any checks you receive include your name or your business name. Provide simple instructions to anybody who’s writing checks to you so that they’re not tempted to take shortcuts.